Soup summons up a vision of steam rising from a bowl, exchanging heat for the cold in your fingers and toes. A bowl of soup is modestly beautiful and very healthy when prepared with lots of vegetables. Soup can be an easy answer to that “what-to-serve” problem on a cold, dark night. After you have put on your heaviest sweater and hunkered down to prepare a meal that is simple, filling and will warm your heart and soul, nothing fits the bill better than a hearty soup. Soup summons up a vision of steam rising from a bowl, exchanging heat for the cold in your fingers and toes. 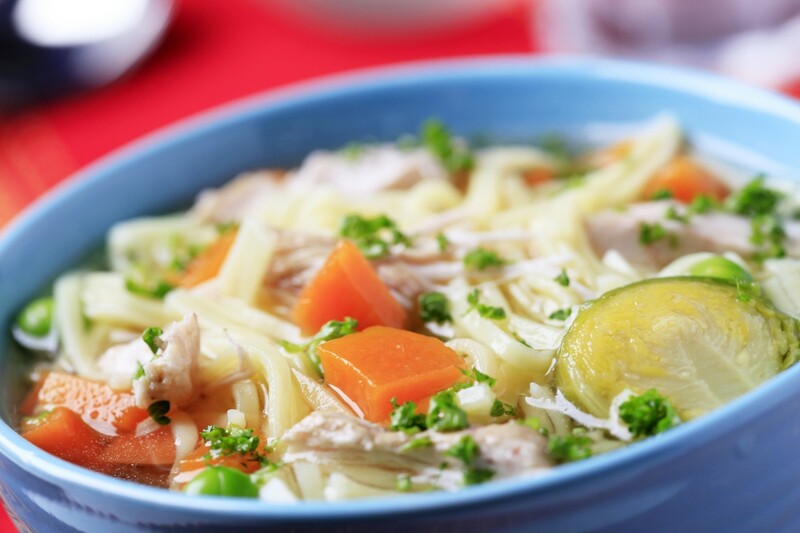 A bowl of soup is modestly beautiful and very healthy when prepared with lots of vegetables. Remember to visit your local farmers’ market for a wonderful selection of organic fruits and vegetables to add some new flavors into your meal rotation. In a small bowl, whisk the eggs, parsley, nutmeg and a large pinch each of salt and pepper. Stir in 1/2 cup of grated cheese. In a large saucepan, bring the stock to a boil over moderately high heat. Vigorously whisk in the eggs; then stir in the spinach. Cook over low heat, stirring a few times, until the egg and spinach are cooked, about 2 minutes. Remove from the heat. Ladle into small bowls and serve with more cheese. Yield: 8 servings. Trim and chop the cauliflower into large pieces. In a large pot, combine all of the ingredients except salt, almond milk and garnish. Add enough water to cover the vegetables, season with salt, and bring to a boil. Simmer over low heat until very tender, about 30 minutes. Cool slightly. Working in batches, purée the soup in a blender until smooth. Transfer to a clean pot and stir in the almond milk. Rewarm over moderate heat, adding more water or milk for a thinner consistency, if desired. Season with salt, to taste. Garnish with cashews and serve. Yield: 6 servings. Heat the oil in a large Dutch oven or stockpot. Sauté the onion over medium-high heat until soft, about 5 minutes. Add the garlic and ginger, and cook until fragrant, about 2 minutes. Stir in the pumpkin, stock, coconut milk, sugar and salt. Bring to a boil, then reduce heat to medium and simmer for 20 to 25 minutes, until the soup coats the back of a spoon. Purée using an immersion or stand blender until smooth. Meanwhile, in a small skillet, toast the coconut over medium heat, stirring occasionally, until golden brown, about 3 minutes. Garnish with the toasted coconut and serve. Yield: 4 servings. In a large saucepan over medium heat, add the coconut oil and heat until melted. Add the onion and chile, stirring occasionally, until onion is fairly soft and translucent, about 5 minutes. Add ground allspice and stir; then add the stock and quinoa and bring to a boil. Cover and simmer until the quinoa is tender, about 15 to 20 minutes. Add the coconut milk and lime juice; then stir. (Do not let the coconut milk boil or it will separate.) Season with salt, to taste. Garnish with cilantro and serve. Yield: 4 servings. Sources: bonappetit.com, gourmet.com and Joanne’s recipe box.